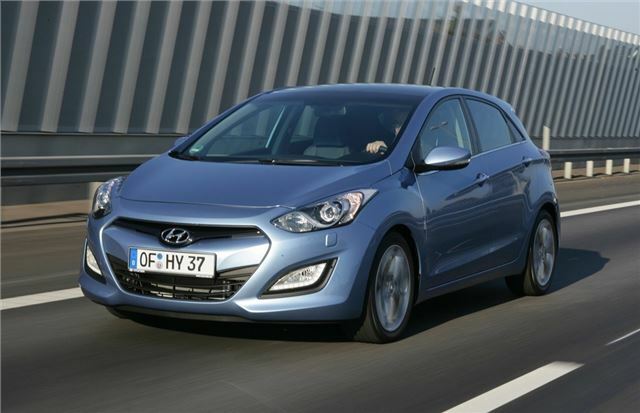 Hyundai has announced that its new i30 will cost from £14,495 when it goes on sale in March this year. That gets you the entry-level Classic trim of the all-new verison of Hyundai's hatchback with a 1.4-litre petrol engine. The cheapest diesel will be the 1.4 CRDi which is priced at £16,145 and emits just 109g/km of CO2. The i30 comes well equipped as standard with all models getting voice-activated Bluetooth, LED daytime running lights, vehicle stability control along with electrically adjustable and heated mirrors plus a multifunction steering wheel. Moving up a level from the Classic to the Active adds 15-inch alloy wheels, cruise control, rear parking sensors plus a new system called Flex Steer which has three settings - comfort, normal and sport. Top Style models get 16-inch alloys, dual zone climate control, front parking sensors, cornering lights and rain sensitive wipers. There is also the Style Nav, which - as the name suggests - includes a touchscreen satellite navigation system plus a rear parking camera. All 1.6 CRDi diesels come with Hyundai’s fuel-saving Blue Drive system which includes an engine start-stop system. This helps improve economy and reduce emissions with the 110PS version of the engine emitting just 97g/km meaning zero annual car tax.